It wasn’t that I didn’t realize that yesterday was Sunday. I just couldn’t get these pictures off my phone. Sure enough, there they are today. No, this is not one of my low-volume projects. 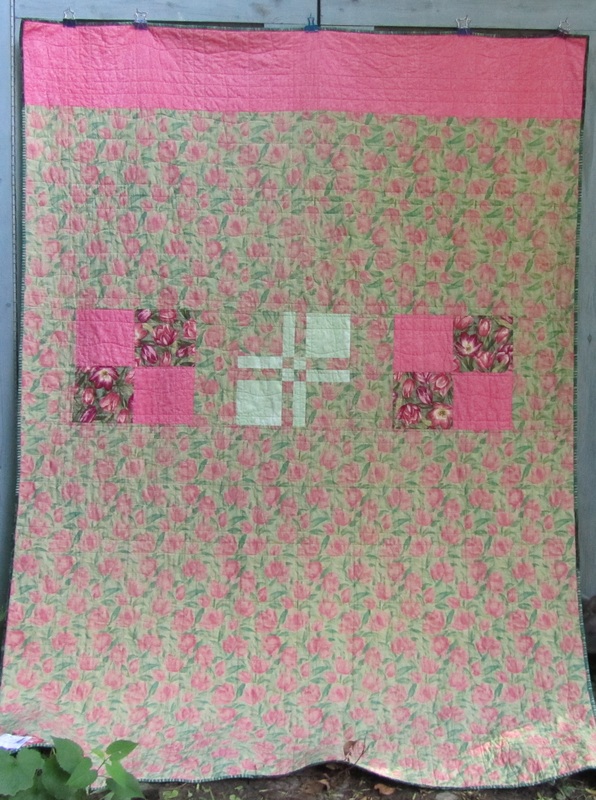 I had made a leader-and-enders kit with old scraps (maybe twelve years old), and the blocks were ready to be sewn together and quilted. 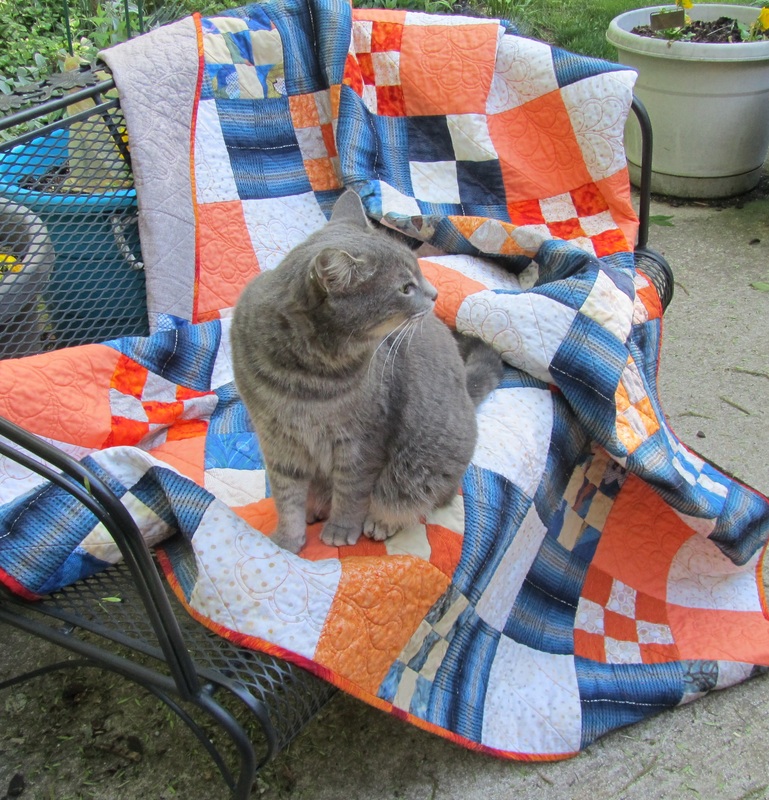 I backed it with the last of a very bright stripe from a line of road construction fabric. 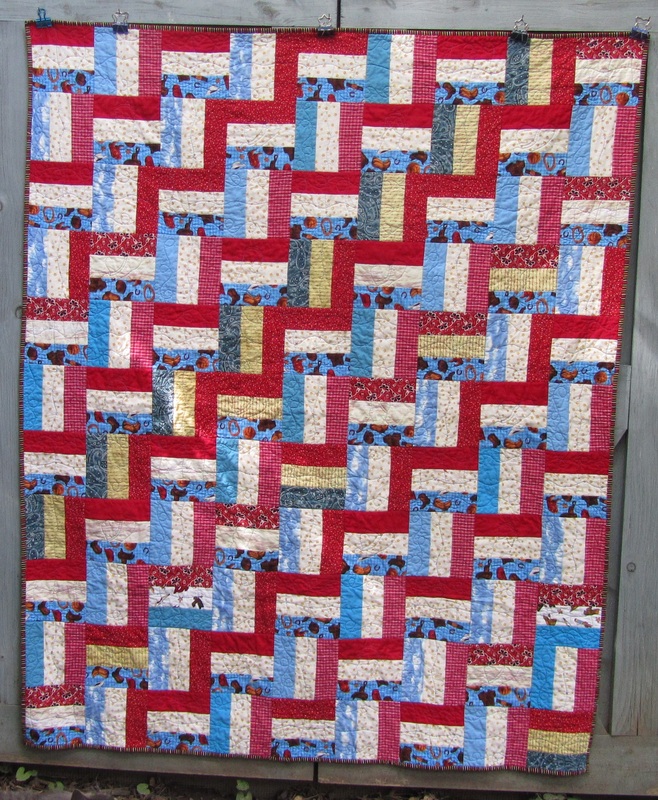 I used the last smidges of the stripe for the binding, but didn’t have enough, so I used my last strip of bar code stripe. 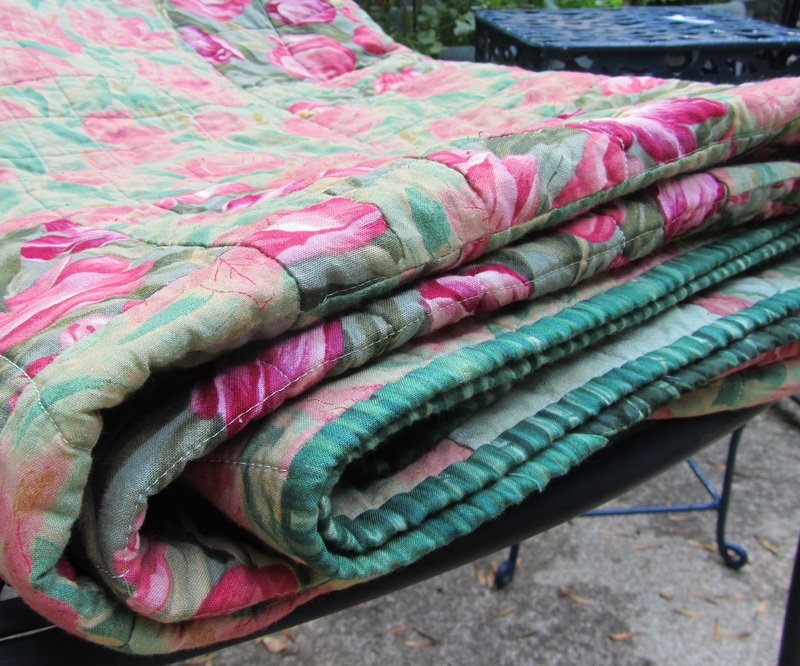 It all used about three yards of fabric. 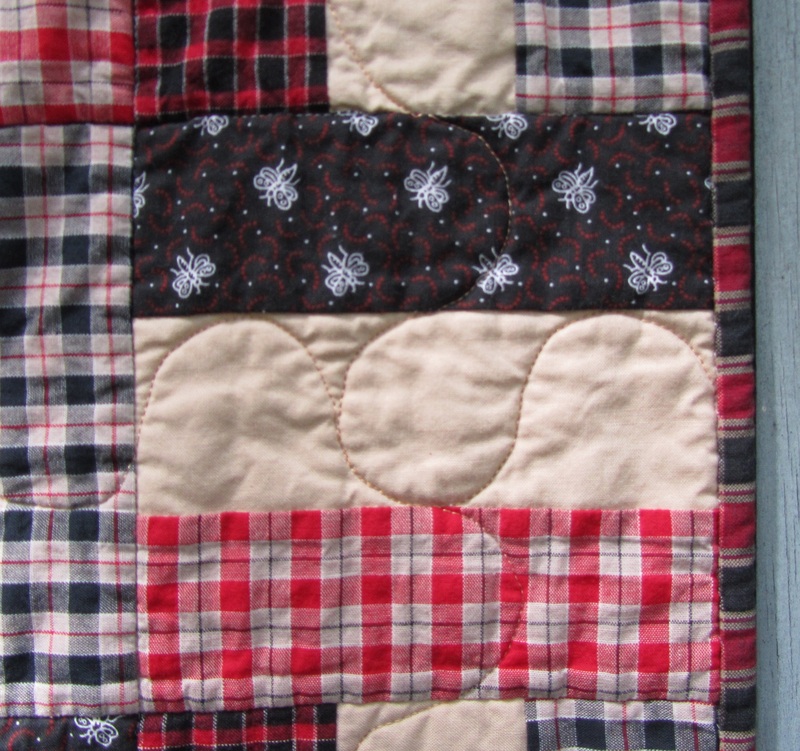 I quilted it diagonally in both directions with yellow Sulky thread. 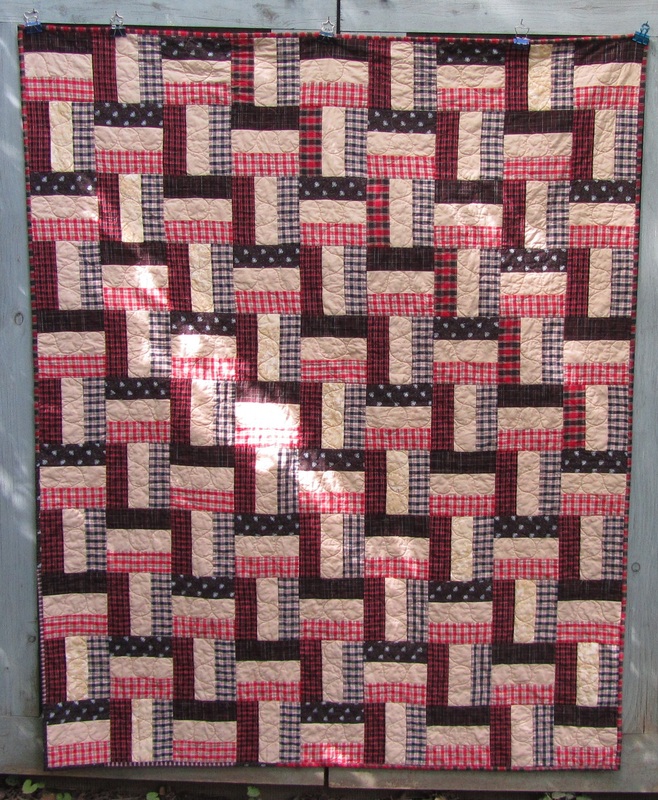 I’ll be donating this to Project Linus. 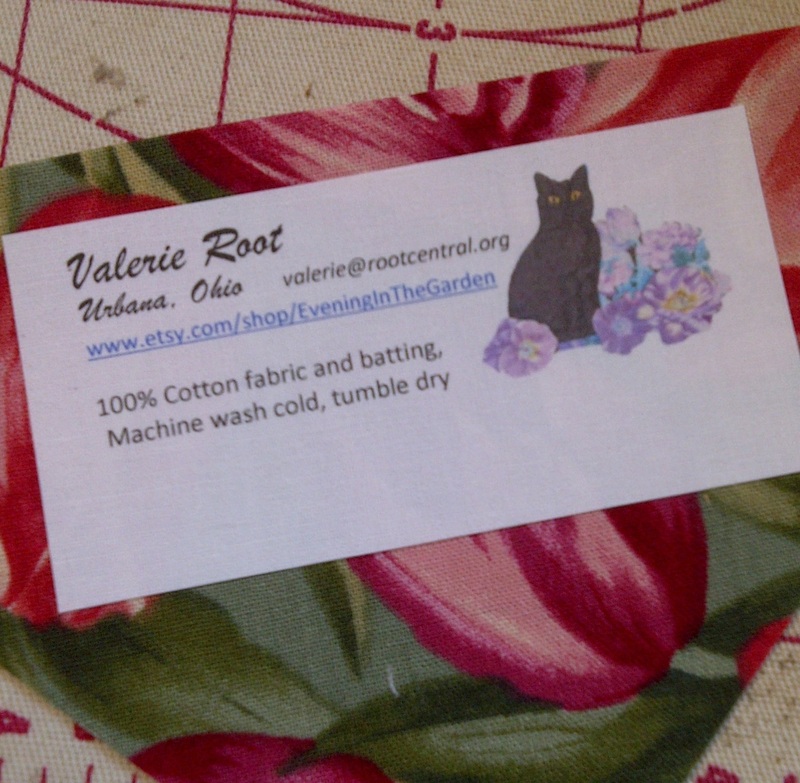 Hope you are well, and finding time to sew your stash. 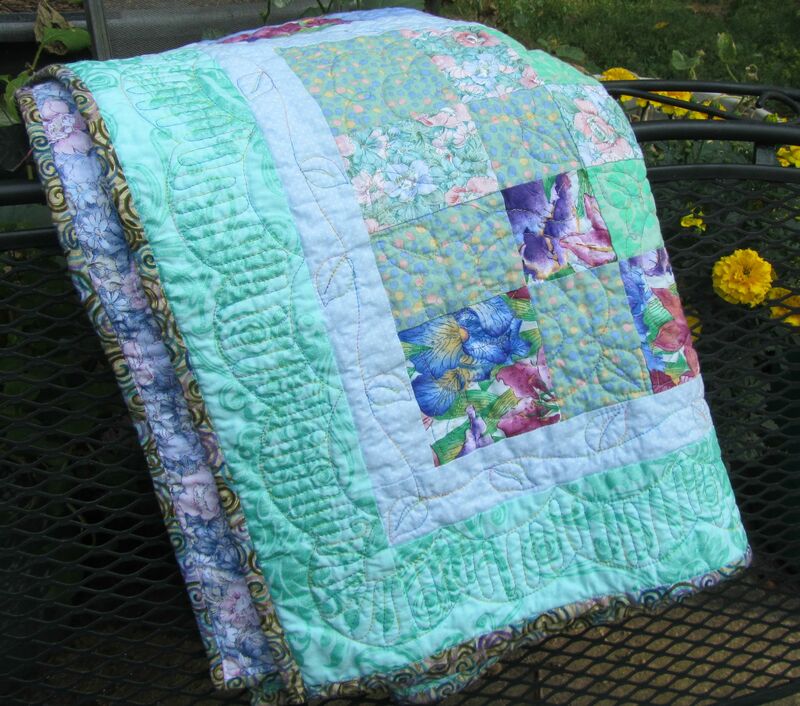 Categories: Donations | Tags: baby quilts, Evening in the Garden, leader-and-enders, Project Linus, Valerie Root | Permalink. All done! And successful. 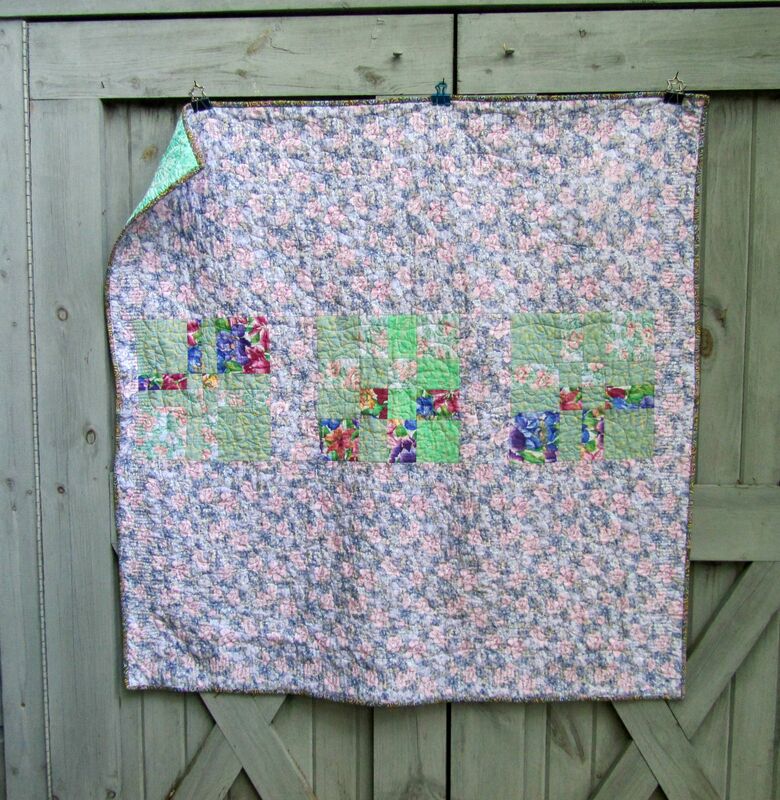 I have to say that this is one of those quilts that I saw in my mind’s eye and was able to create the vision from fabric. Yes, I got tired of looking at the pink, but it was the right choice. 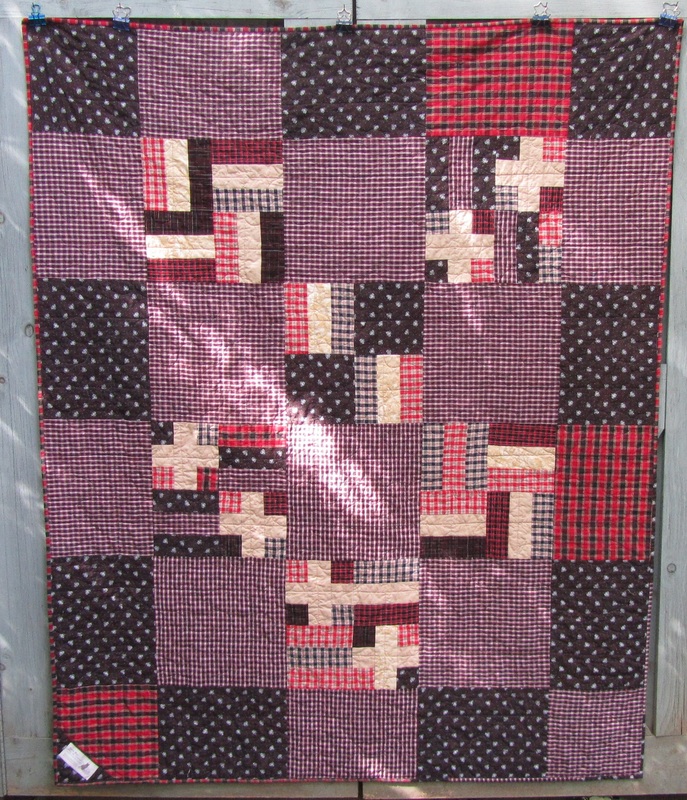 I did use my design wall a lot, really changing around the position of the blocks, and enlisting input from the Twilters, but in the end I think it became a rich and inviting quilt. I think the two tulip prints worked together because they are the same scale and use different values of the same colors. 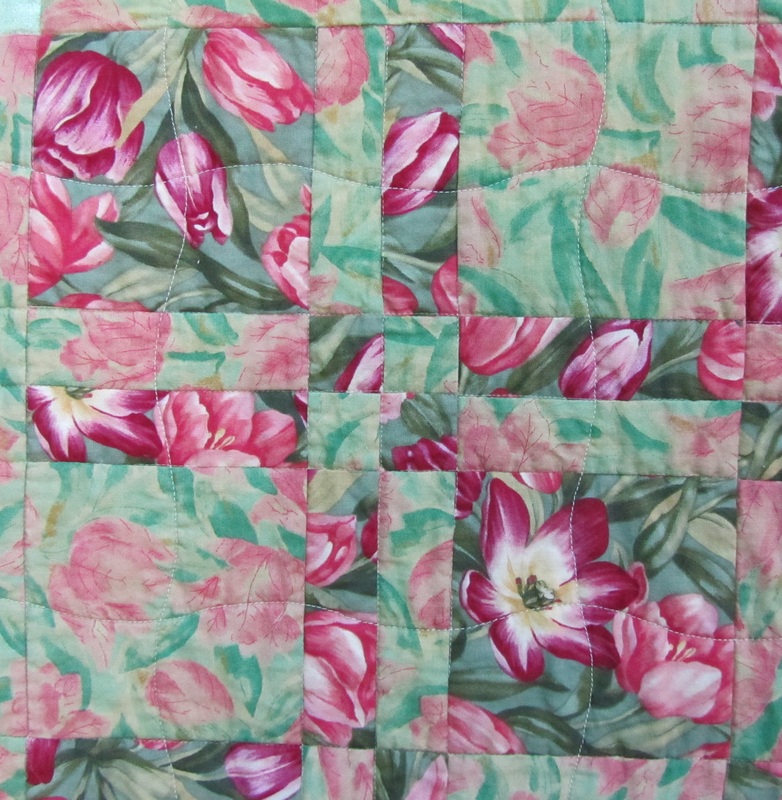 The extra blocks and the rest of the lighter tulip fabric went on the back. 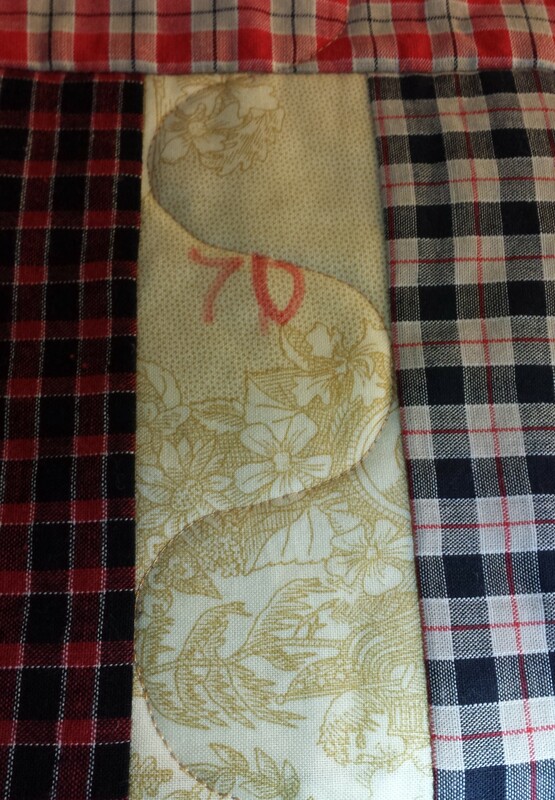 I did a really good job using up all of these two fabrics but for a few scraps. My stash feels lighter. 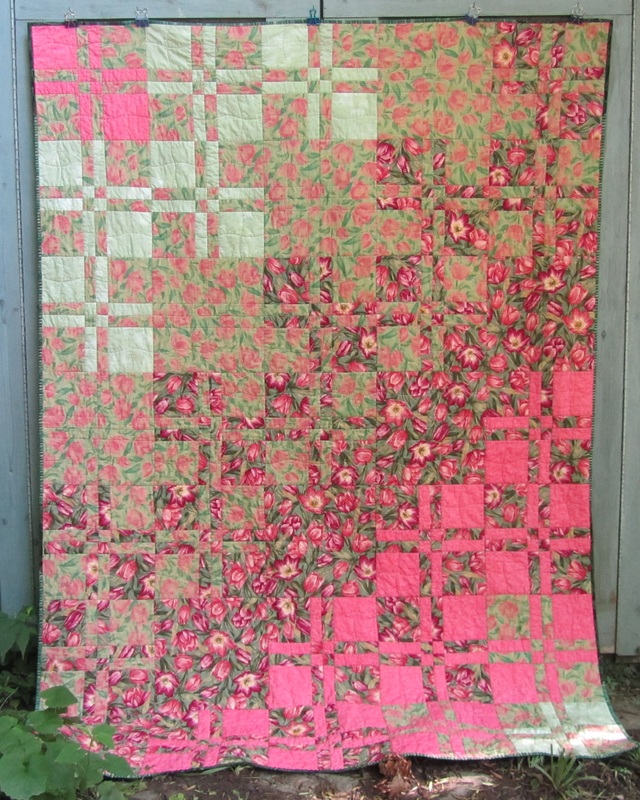 This is quilted in all the ditches with Bottom Line thread. 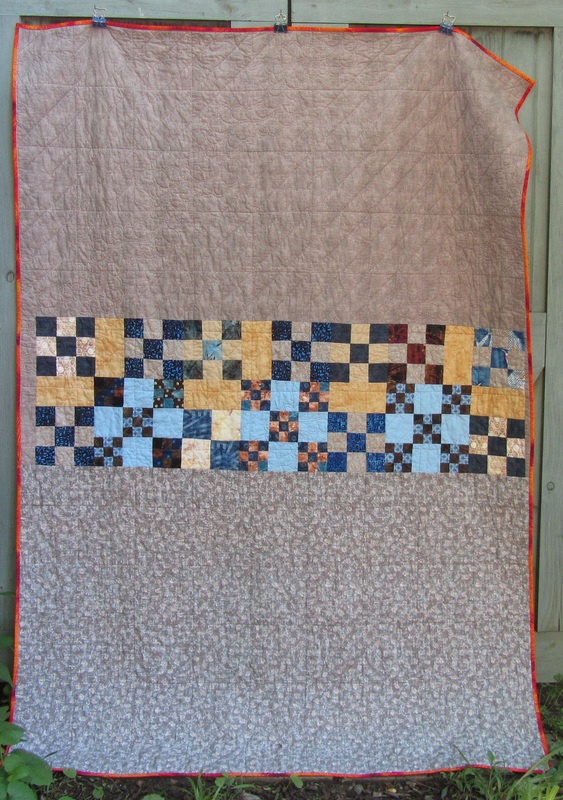 I did do the accent quilting with pale green King Tut, but I decided to mark it with wavy lines through every row of squares and quilt those lines with the walking foot. 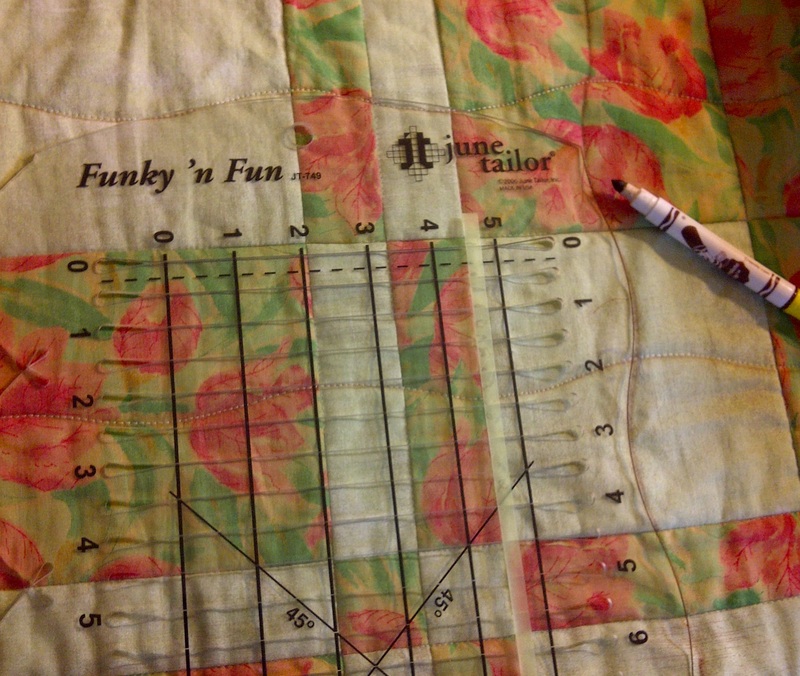 I have two of these June Tailor rulers for various sizes of curves and scallops, and I use them a lot. 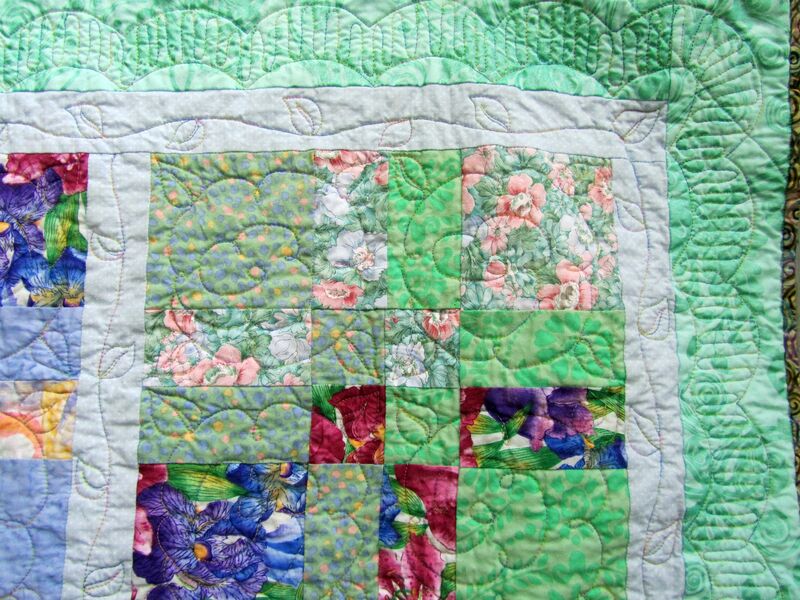 Are you aware of how many shades of green fabric do not match this quilt? 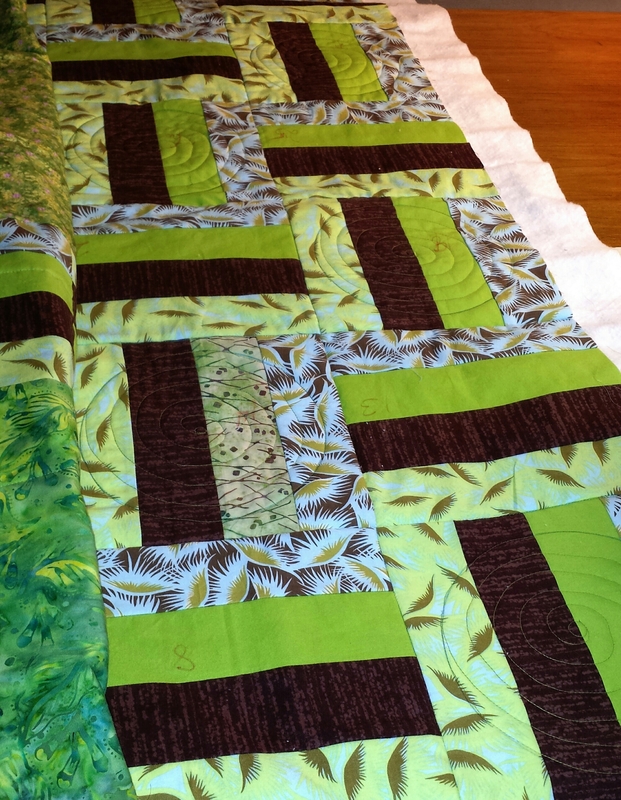 I have two drawers of green fabric, and almost none of it was suitable for the binding. I finally combined two pieces that look very similar, one darker than the other. It doesn’t really look scrappy, just shaded. 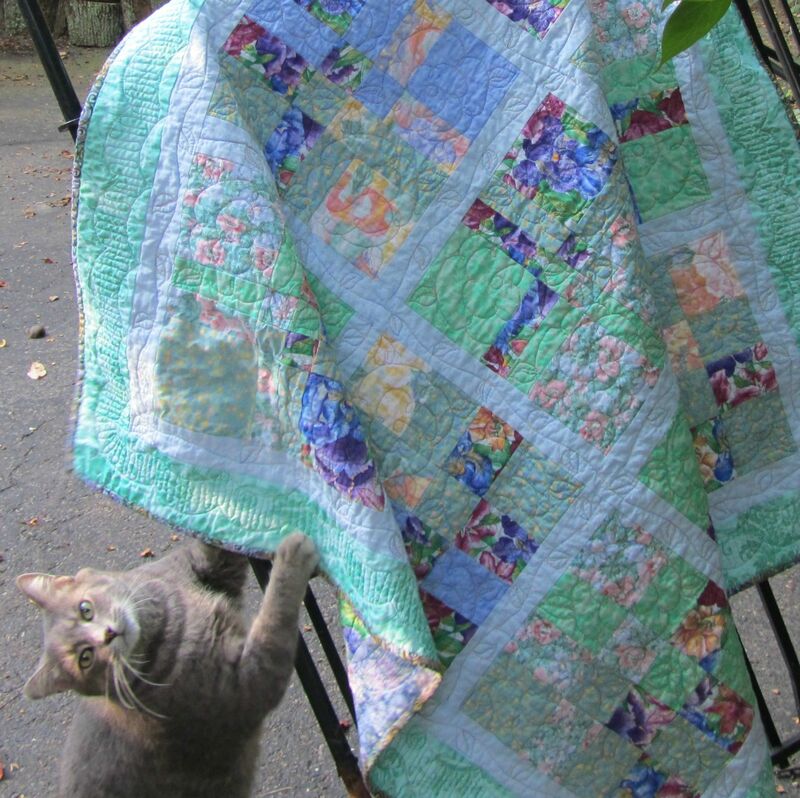 Categories: Donations, Finishes | Tags: Crazy Mom Quilts, donation quilt, Evening in the Garden, finish it up friday, Getting It Done, modern quilt, Valerie Root | Permalink. 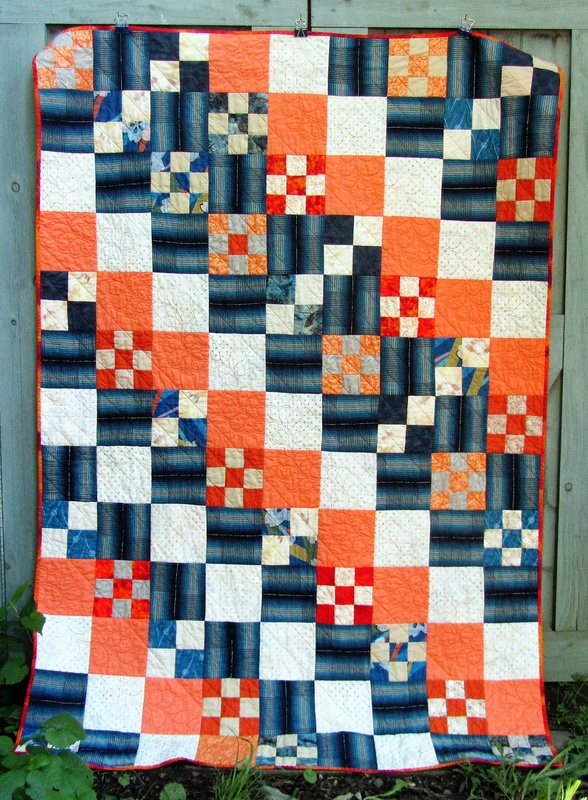 I finished up the blue and orange donation quilt yesterday. 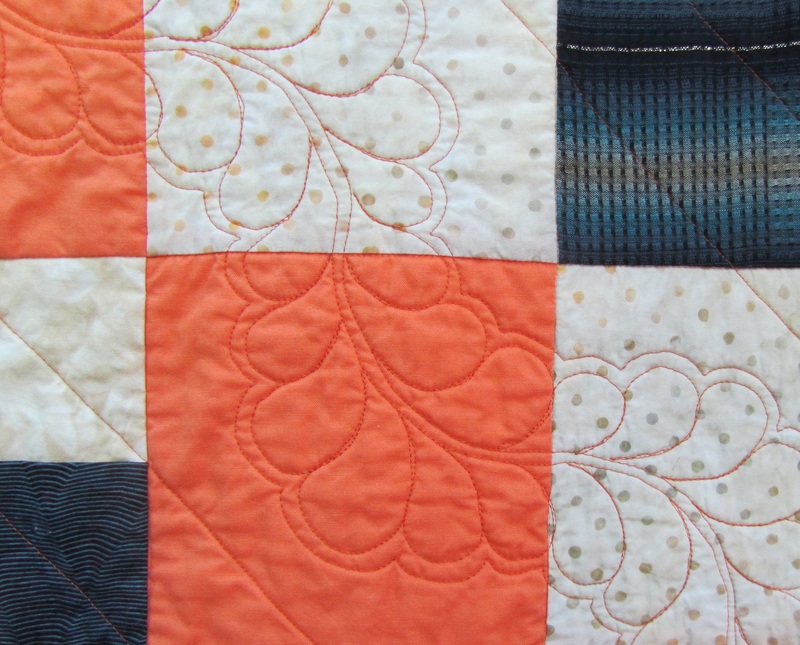 I had a lot of fun quilting it with straight lines and feathers in orange thread (Superior Highlights, 40 wt.). 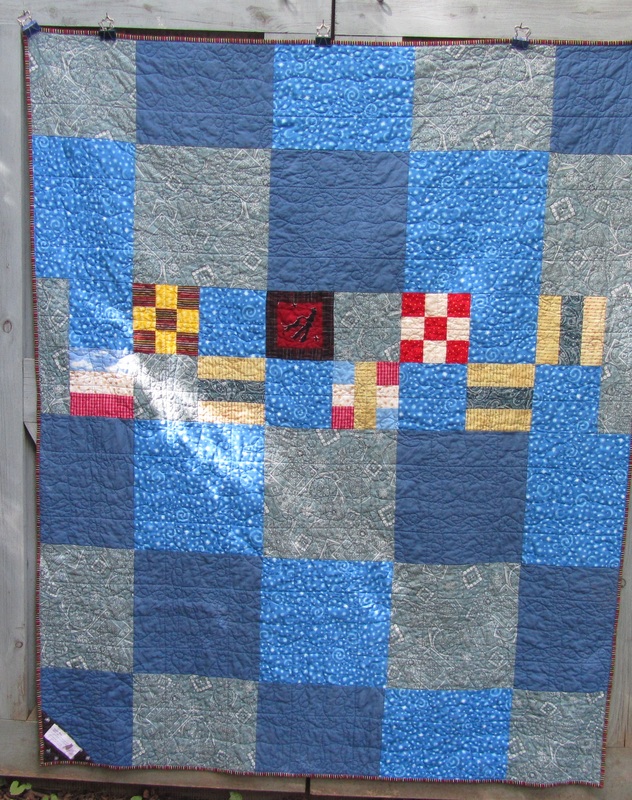 The textured blue fabric was weird and stretchy to piece together, but not too bad to quilt with the walking foot. 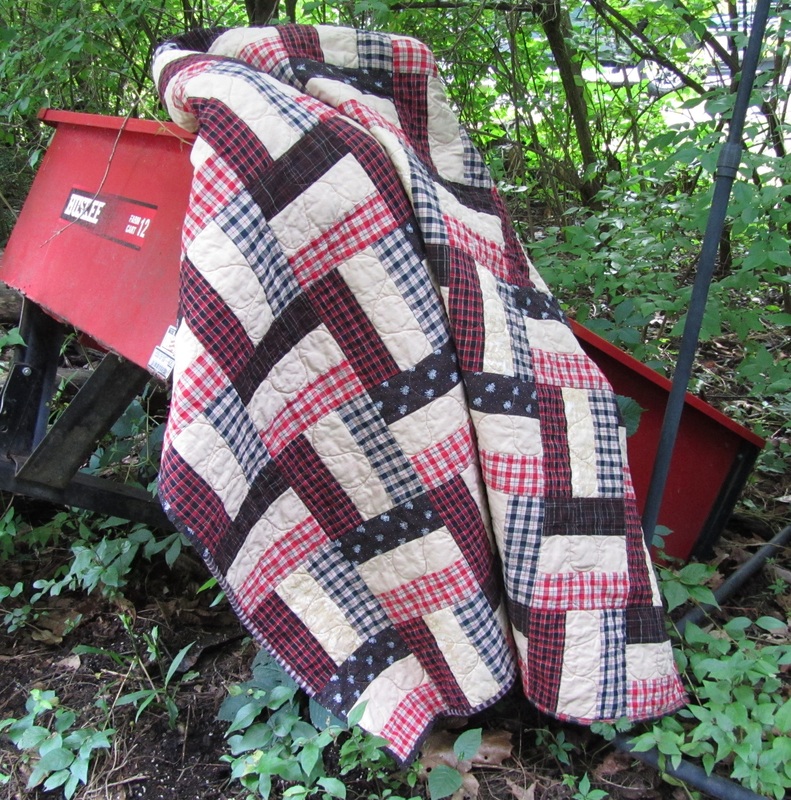 It has great cozy texture now that it’s washed up. I have to admit that I like the back almost as much as I like the front. 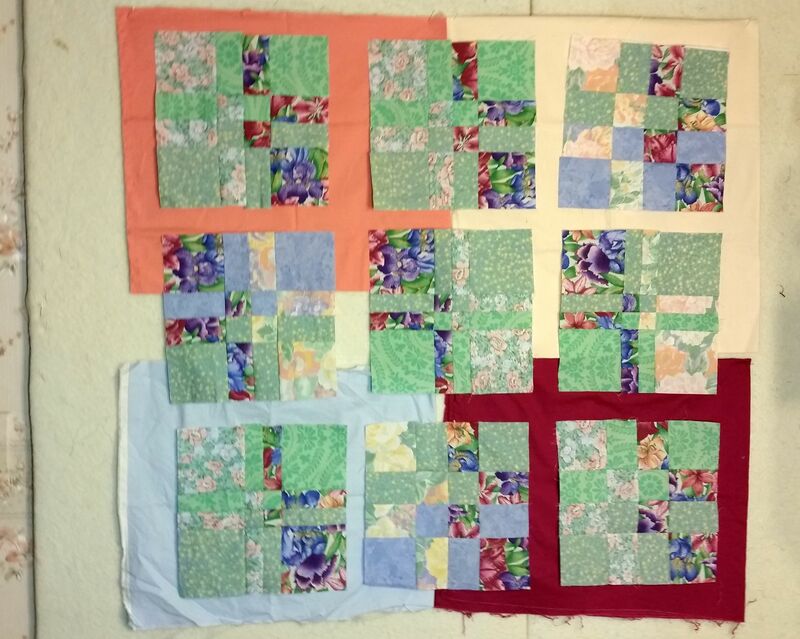 These are orphan blocks from a double nine patch that I had made, and some from this quilt, when I discovered that too many nine patches would make it too busy. 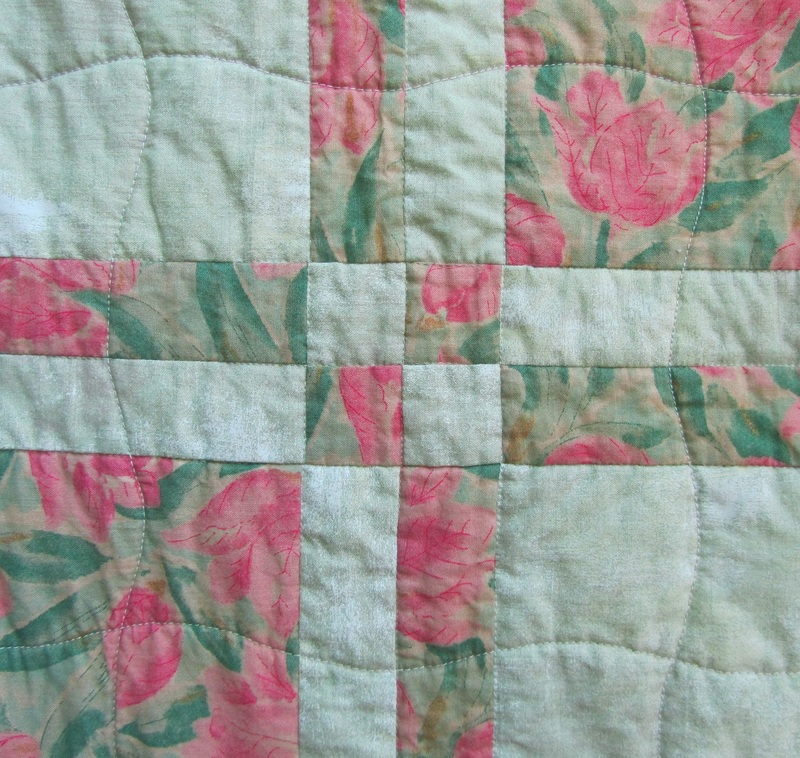 So much of the stash fabric I have and need to use is floral, and makes pretty feminine quilts. 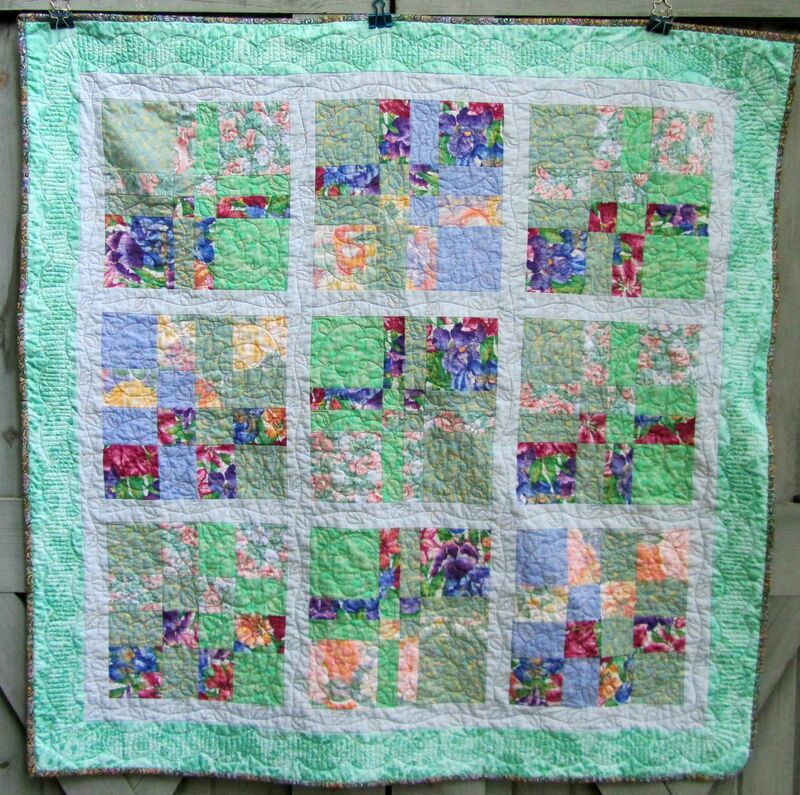 I try to switch off by making every other donation quilt out of something a little more appealing to anyone, including men. And, apparently, cats. Lots of help. 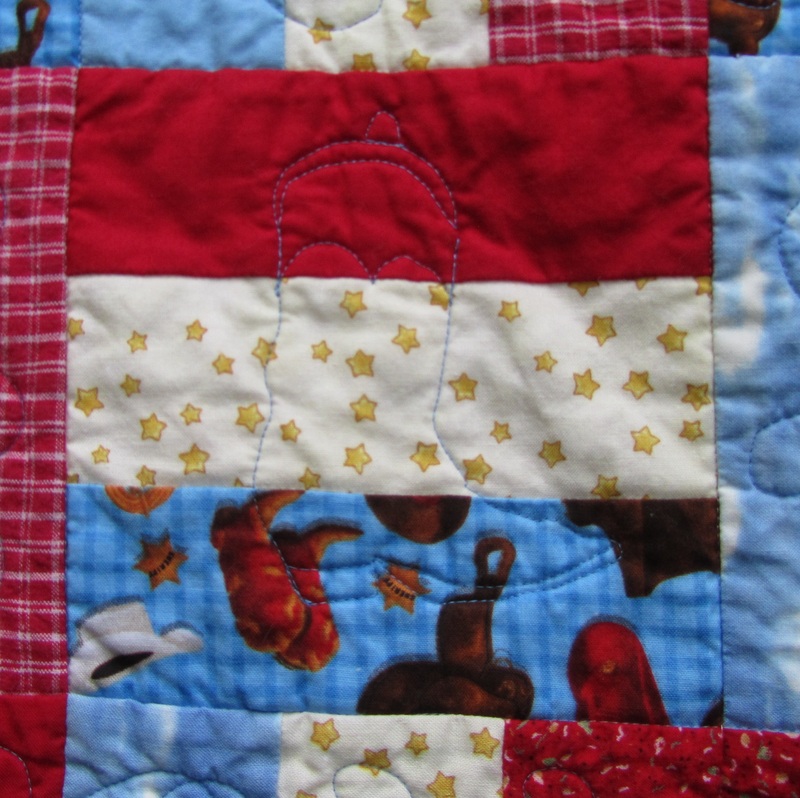 This is headed to Moore, OK.
You could have knocked me over with one of my own feathers yesterday when I answered the phone and it was Judy Laquidera from Patchwork Times! 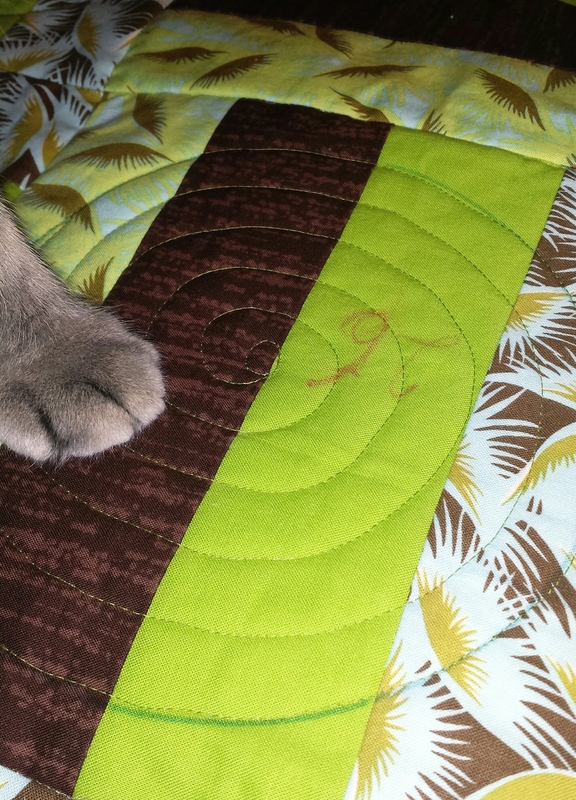 I was sewing the binding to this quilt when she called. 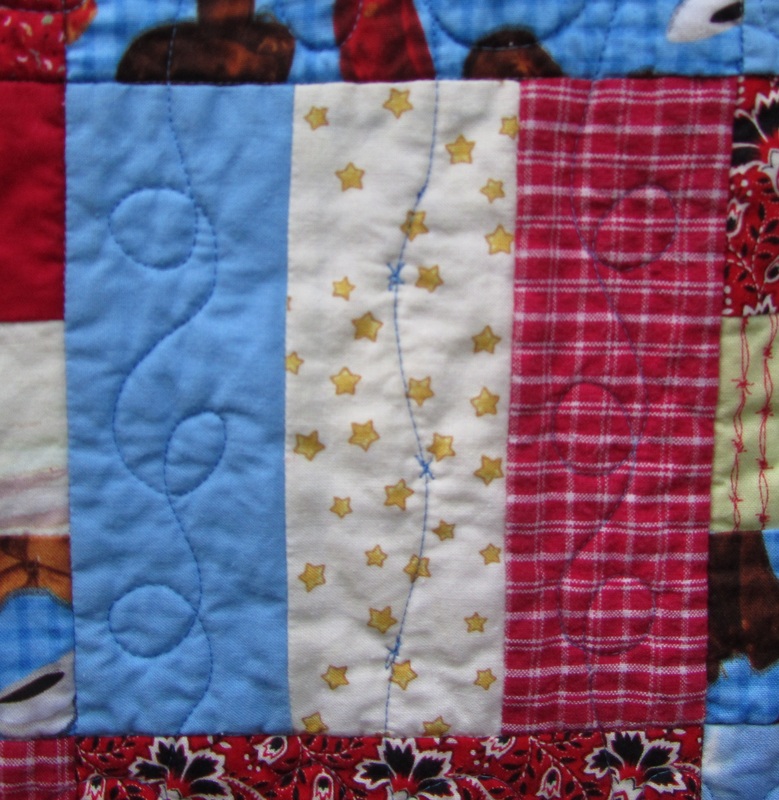 She called several of us who had donated quilts for West, TX, to see if we minded if she sent them on to Moore. They have all they need in West, and Judy knew of a truck with people she trusts going to Moore. 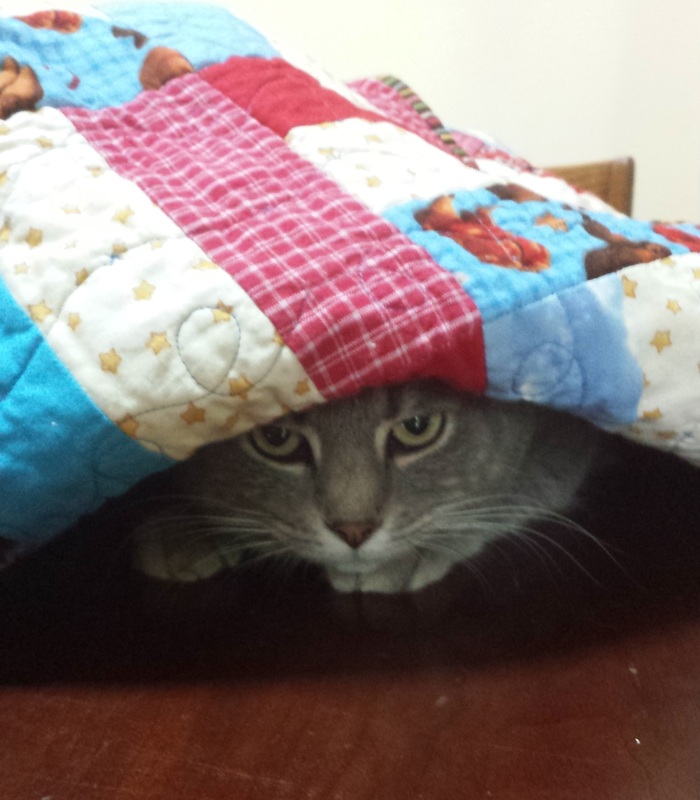 I told her I was fine with that, so I guess my pink and gray quilt will go there, too. Doesn’t it seem like there’s been a lot of need this year? 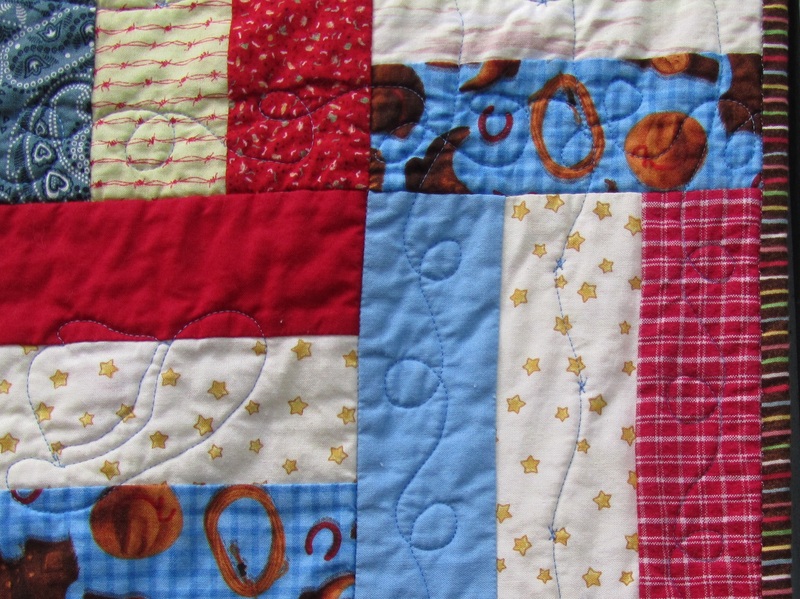 I sorted some strings last night to start a new donation quilt for whatever comes next. Don’t even want to think about that. 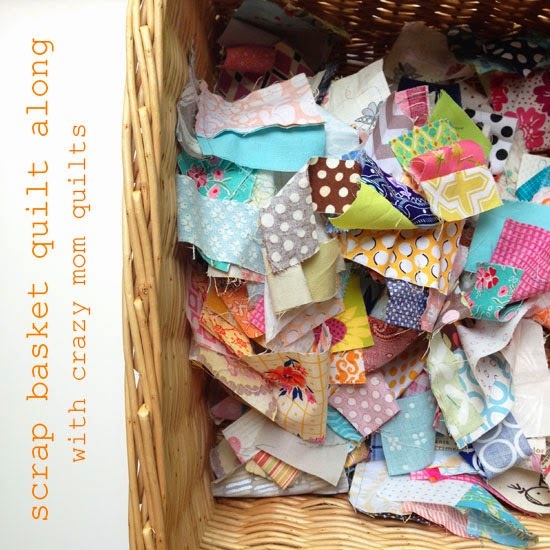 Categories: Donations, Finishes | Tags: Crazy Mom Quilts, Evening in the Garden, finish it up friday, modern quilt, Patchwork Times, stash reduction, Valerie Root | Permalink.